What are you thinking? How are you feeling? What have we done to each other? 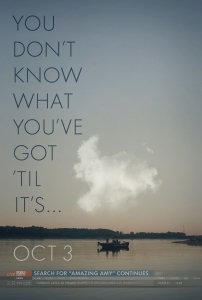 And, so begins Gone Girl (in theaters now), David Fincher‘s film adaptation of Gillian Flynn‘s phenomenally successful novel (it spent a staggering 91 weeks on the New York Times bestseller list). Thanks to Flynn’s faithful screenplay and Fincher’s moody direction, the movie retains its biting, unflinching, and unpredictable core. It details the anatomy of a marriage — Nick and Amy’s — a union that is not all that it seems. Check out Flynn’s first two offerings — Sharp Objects and Dark Places — both cavernous and creepy. Then, anxiously await what’s next from this brilliant storyteller. The meticulous Fincher has an estimable body of work to his name, but the crème de la crème remain Se7en, Fight Club, and Zodiac. ← Overdue for a Library Card?